It’s been a while since we offered up a brand new mix to massage your lug’oles, so here’s a solo seesion – in the usual Bedmo Disco style – from Sell By Dave. We recently recorded a brand new joint Bedmo Disco mix for the Unity Agency, so expect that very soon, too. So, this mix then. It’s loosely themed around the idea of an office Christmas party, though there are no dodgy Christmas songs. 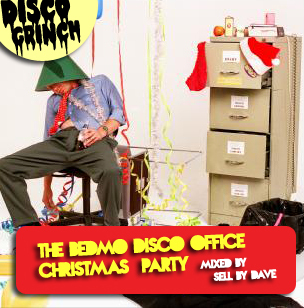 It’s basically the sort of thing we’d listen to if we actually had a Bedmo Disco Records office party around this time of year – think a fun and funky, floor-friendly blend of midtempo disco, electrofunk, boogie, house, soul and re-edits. Look out for a couple of brand new, previously unheard tracks from Bedmo Disco and Awon, due on the label in 2012, and some unreleased re-edits from Sell By Dave and Andrew Allsgood.